Interstate 80 (I-80) is an east–west transcontinental freeway in the United States that runs from downtown San Francisco, California, to Teaneck, New Jersey, in the New York City Metropolitan Area. 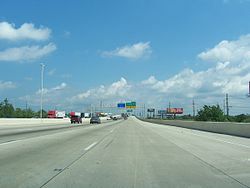 The highway was designated in 1956 as one of the original routes of the Interstate Highway System. Its final segment was opened to traffic in 1986. It is the second-longest Interstate Highway in the United States, following I-90. The Interstate runs through many major cities including Oakland, Sacramento, Reno, Salt Lake City, Omaha, Des Moines, and Toledo, and passes within 10 miles (16 km) of Chicago, Cleveland, and New York City. I-80 is the Interstate Highway that most closely approximates the route of the historic Lincoln Highway, the first road across the United States. The highway roughly traces other historically significant travel routes in the Western United States: the Oregon Trail across Wyoming and Nebraska, the California Trail across most of Nevada and California, the first transcontinental airmail route, and except in the Great Salt Lake area, the entire route of the First Transcontinental Railroad. 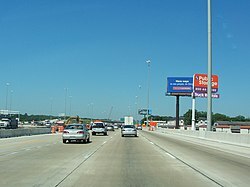 From near Chicago east to near Youngstown, Ohio, I-80 is a toll road, containing the majority of both the Indiana Toll Road and the Ohio Turnpike. I-80 runs concurrently with I-90 from near Portage, Indiana, to Elyria, Ohio. 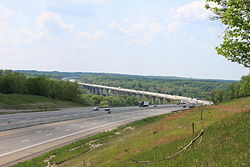 In Pennsylvania, I-80 is known as the Keystone Shortway, a non-tolled freeway that crosses rural north-central portions of the state on the way to New Jersey and New York City. The eastern end of I-80 in Bergen County, New Jersey. Visible at the top of the photo are the George Washington Bridge and New York City. I-80 begins at an interchange with U.S. Route 101 (US 101) in San Francisco, and then crosses the San Francisco–Oakland Bay Bridge into Oakland. It then heads northeast through Vallejo, Sacramento, and the Sierra Nevada mountains before crossing into Nevada. A portion of the route through Pinole involved the experimental transplantation of the rare species Santa Cruz tarweed in the right-of-way. In Nevada, I-80 traverses the northern portion of the state. The freeway serves the Reno– Sparks metropolitan area, and it also goes through the towns of Fernley, Lovelock, Winnemucca, Battle Mountain, Elko, Wells, and West Wendover on its way through the state. The Nevada portion of I-80 follows the paths of the Truckee and Humboldt rivers, which have been used as a transportation corridor since the California Gold Rush of the 1840s. The Interstate also follows the historical routes of the California Trail, First Transcontinental Railroad, and Feather River Route throughout portions of the state. I-80 in Nevada closely follows, and at many points directly overlaps, the original route of the Victory Highway, State Route 1, and US 40. After crossing Utah's western border in Wendover, I-80 crosses the desolate Bonneville Salt Flats west of the Great Salt Lake. 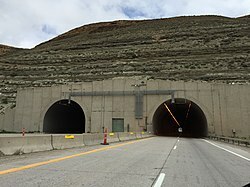 The longest stretch between exits on an Interstate Highway is located between Wendover and Knolls, with 37.4 miles (60.2 km) between those exits. This portion of I-80, crossing the Great Salt Lake Desert, is extremely flat and straight, dotted with large warning signs about driver fatigue and drowsiness. East of the salt flats, I-80 passes the southern edge of Great Salt Lake and continues on through Salt Lake City, where it merges with I-15 for three miles (4.8 km) before entering the Wasatch Mountains east of the city. It ascends Parley's Canyon and passes within a few miles of Park City as it follows a route through the mountains towards the junction with the eastern terminus of the western section of I-84. From the junction it continues up Echo Canyon and on towards the border with Wyoming, near Evanston. In Wyoming, I-80 reaches its maximum elevation of 8,640 feet (2,630 m) above sea level  at Sherman Summit, near Buford, which at 8,000 feet (2,400 m) is the highest community on I-80. Farther west in Wyoming, the Interstate passes through the dry Red Desert and over the Continental Divide. In a way, the highway crosses the Divide twice, since two ridges of the Rocky Mountains split in Wyoming, forming the endorheic Great Divide Basin, from which surface water cannot drain, but can only evaporate. I-80 enters Nebraska west of Bushnell. The western portion of I-80 in Nebraska runs very close to the state of Colorado, without entering the state. 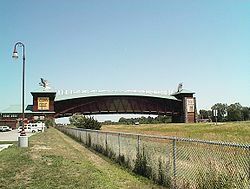 The intersection of I-76 and I-80 is visible from the Colorado–Nebraska state line. From its intersection with I-76 to Grand Island, I-80 lies in the valley of the South Platte River and the Platte River. 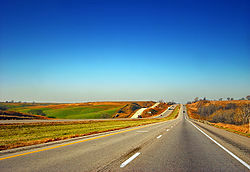 The longest straight stretch of Interstate anywhere in the Interstate Highway System is the approximately 72 miles (116 km) of I-80 occurring between exit 318 in the Grand Island area and mile marker 390 near Lincoln. Along this length, the road does not vary from an ideally straight line by more than a few yards. After Lincoln, I-80 turns northeast towards Omaha. It then crosses the Missouri River in Omaha to enter the state of Iowa. Part of I-80 in Nebraska is marked as a Blue Star Memorial Highway. In Illinois, I-80 runs from the Fred Schwengel Memorial Bridge across the Mississippi River south to an intersection with I-74. It then runs east across north-central Illinois just north of the Illinois River to Joliet. I-80 continues east and joins I-94 just before entering Indiana. In Indiana, I-80 runs concurrently with another Interstate Highway for its entire length. It runs with I-94 on the Borman Expressway from the Illinois state line to Lake Station, Indiana, and the Indiana Toll Road with I-90 from Lake Station to the Ohio state line. In Elyria Township, just west of Cleveland, I-90 splits from I-80, leaving the turnpike and running northeast as a freeway. I-80 runs east-southeast through the southern suburbs of Cleveland. Just northwest of Youngstown, the Ohio Turnpike continues southeast as I-76, while I-80 exits the turnpike and runs east to the north of Youngstown, entering Pennsylvania south of Sharon, Pennsylvania. In Pennsylvania, I-80 is the main east–west Interstate-standard highway through central Pennsylvania. It runs from the Ohio state line near Sharon to the Delaware Water Gap Toll Bridge over the Delaware River and is called the "Z.H. Confair Memorial Highway". It traverses the extreme northern section of the Pittsburgh metropolitan area. A spur from I-80 ( I-180) runs to Williamsport, while another ( I-380) runs to Scranton. I-80 intersects I-476 in the Pocono Mountains which connects with Scranton, Wilkes-Barre, Allentown and Philadelphia. I-80 intersects I-79 in Western Pennsylvania which connects with Erie (about 75 miles [121 km] to the north) and Pittsburgh (about 55 miles [89 km] to the south). Additional intersections include I-81 connecting Syracuse, New York, and Harrisburg while I-99 connects with State College and Altoona. Also in Western Pennsylvania I-80 serves as the western terminus for I-376 which connects it to the Pittsburgh International Airport and on to downtown and suburban Pittsburgh. In Clearfield County, I-80 reaches its highest elevation east of the Mississippi River, 2,250 feet (686 m), although other Interstate Highways east of the Mississippi, including I-26 in North Carolina and Tennessee, reach higher elevations. I-80 does not enter New York City. Once the I-95/ New Jersey Turnpike was extended in 1971 from its former terminus at US 46 in Ridgefield to I-80 in Teaneck the section from Teaneck to Fort Lee was resigned as I-95, and it is the latter roadway that enters New York City via the George Washington Bridge. I-80's designated end (as per signage and New Jersey Department of Transportation documents) is four miles (6.4 km)  short of New York City in Teaneck, before the Degraw Avenue overpass. There, signs designate the end of I-80 and the beginning of I-95/New Jersey Turnpike northbound. I‑580 on the Oakland– Emeryville city line. The highways travel concurrently to Albany. US 95 south-southwest of Lovelock. The highways travel concurrently to Winnemucca. I‑15 in Salt Lake City. The highways travel concurrently to South Salt Lake. US 40 / US 189 in Silver Creek Junction. I-80/US 189 travels concurrently to east-northeast of Evanston, Wyoming. US 30 in Little America. The highways travel concurrently to south-southeast of Walcott. US 191 in Purple Sage. The highways travel concurrently to Rock Springs. US 287 east of Rawlins. The highways travel concurrently to south-southeast of Walcott. US 30 southeast of Laramie. The highways travel concurrently to southwest of Cheyenne. US 30 east-northeast of Cheyenne. The highways travel concurrently to Pine Bluffs. US 77 in Lincoln. The highways travel concurrently to north-northeast of Lincoln. I‑29 in Council Bluffs. The highways travel concurrently through Council Bluffs. US 6 / US 71 north-northeast of Lorah. I-80/US 6 travel concurrently to De Soto. I‑35 / I‑235 in West Des Moines. I-35/I-80 travels concurrently to Ankeny. US 65 in Altoona. The highways travel concurrently through Altoona. US 6 / US 65 in Altoona. I-80/US 6 travels concurrently to Newton. US 6 north-northwest of Wilton. The highways travel concurrently to Davenport. I‑280 / US 6 / US 61 in Davenport. I-80/US 61 travels concurrently through Davenport. I‑294 in Hazel Crest. The highways travel concurrently to the South Holland– Lansing village line. I‑94 / I‑294 on the South Holland–Lansing village line. I-80/I-94 travels concurrently to Lake Station, Indiana. US 6 in Lansing. The highways travel concurrently to Lake Station, Indiana. US 41 in Hammond. The highways travel concurrently through Hammond. I‑90 / I‑94 in Lake Station. I-80/I-90 travels concurrently to northwest of Elyria, Ohio. I‑99 / US 220 northwest of Zion. I-80/US 220 travels concurrently to east of Mackeyville. US 209 in Arlington Heights. The highways travel concurrently to east of East Stroudsburg. US 206 west of Stanhope. The highways travel concurrently to south-southeast of Netcong. ^ a b Adderly, Kevin (January 27, 2016). "Table 1: Main Routes of the Dwight D. Eisenhower National System Of Interstate and Defense Highways as of December 31, 2015". Route Log and Finder List. Federal Highway Administration. Retrieved July 17, 2016. ^ Carey, Anne (August 15, 2011). "Top 16 longest gaps between Interstate exits". USA Today. Retrieved January 17, 2017. ^ Utah State Legislature. "§ 72-4-113(10)". Utah Code Annotated. Archived from the original on February 27, 2014. Retrieved January 29, 2013. ^ Wyoming Department of Transportation (2010). Official State Highway Map of Wyoming (Map). c. 1:1,140,480. Cheyenne: Wyoming Department of Transportation. §§ G1–H10. ^ a b Google (August 9, 2012). "Intersate 80 in Iowa" (Map). Google Maps. Google. Retrieved August 9, 2012. ^ Staff (March 29, 2010). 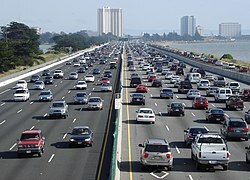 "Population grows in I-80, U.S. 30 corridors". Daily Times Herald. Carroll, IA. Retrieved August 12, 2012. ^ Federal Highway Administration Public Affairs (April 6, 2010). "Federal Highway Administration Declines Pennsylvania Request to Toll I-80" (Press release). Federal Highway Administration. Retrieved October 4, 2014. ^ Weingroff, Richard (Fall 1986). "America Celebrates 30th Anniversary of the Interstate System". U.S. Highways. Federal Highway Administration. ^ "Around the Nation: Transcontinental Road Completed in Utah". The New York Times. Associated Press. August 25, 1986. OCLC 1645522. Retrieved May 13, 2013. ^ John McPhee, "Annals of the Former World" (New York: Farrar, Straus and Giroux, 2000), pp. 36-37. 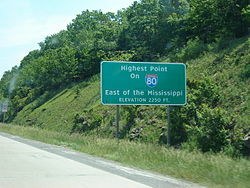 Wikimedia Commons has media related to Interstate 80.